In this post I will try to describe the caching options that are available to you, to increase the responsiveness and the performance of your dynamic website build on top of the Dynamic Delivery for Tridion (DD4T) framework. In a website build with DD4T (almost) all content comes from the Broker Database. The content is stored as an XML string in the database and is transformed (de-serialized) into .NET objects at request time. As you can image this has a huge impact on the performance of your website: on every request the XML is loaded (streamed) from the database and the DD4T framework de-serializes this into usable .NET objects. This is a time-consuming process and puts a heavy load on your webserver. Luckily there are a few options/strategies to improve the performance of your website. And the beauty about these options is that they (almost) come for free! 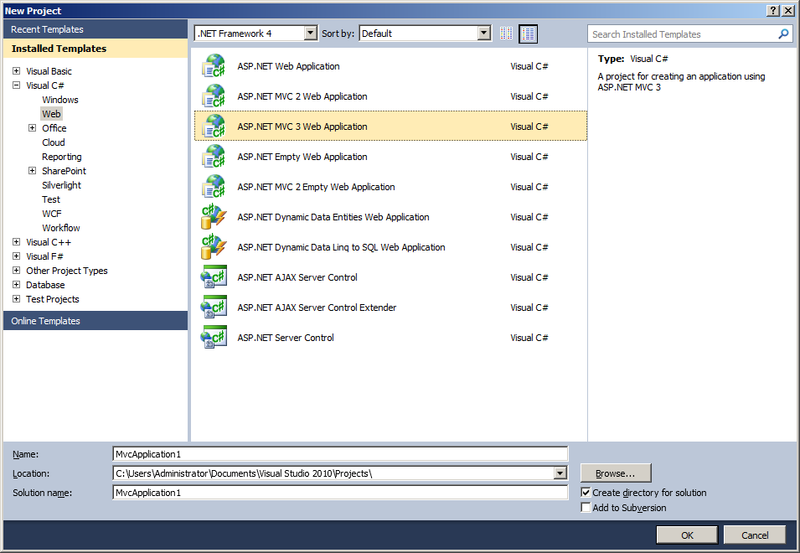 The first option is the out-of-the-box Output caching from ASP.NET. Just decorate your controller (PageController, ComponentController; your choice) with the OutputCache attribute and your done! OutputCache caches the output (…) for the duration you configured in the web.config. If the cache duration is set to 5 minutes, and in these 5 minutes you publish a page, the changes are NOT reflected in your browser if you hit F5. Only after 5 minutes the cache is invalided and on the next request the XML is loaded from the Broker Database. And de-serialized. Luckily for us DD4T ships with a build in cache mechanism. This caching-mechanism is build on top of the .NET System Runtime Cache and can be used in conjunction with the Output Cache. DD4T caching stores de-serialized objects like Components and Pages in the .NET Runtime cache after they are requested for the first time. Every consecutive request for that page/component loads it from the Object cache instead of loading it from the Broker database and de-serializing it into a .NET objects. As you can imagine, this causes a massive performance improvement. But how does DD4T ‘know’ when to invalidate the item in the cache? Because if you re-publish a page or component, you want your website to show the updated page/component. Well, this ‘asking’ is implemented in DD4T. DD4T poll’s every x seconds/minutes/hours/etc (configurable) if the LastPublishDate from an item in the cache has changed. If it has changed (the item was republished) it will invalidate this item. The next time this item is requested, it will be loaded from the Broker databases, de-serialized and stored in the cache. In this example, DD4T poll’s the Broker Database every 30 seconds to check if the items in the cache are still valid. Also, after a configurable amount of time, the item is -no matter what- invalidated. 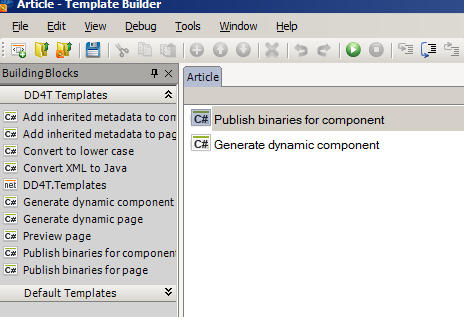 The amount of time can be configured separately for pages and components. In this example all the pages and components in the cache are invalidated after 1 hour. To improve the performance of your Web site, you can choose to store the most commonly used or resource-intensive objects from your Content Data Store in a cache. The cache keeps these objects available for the applications that request them, rather than reinitializing them each time they are requested. Pretty obvious right? So no need to explain it further. As we have discussed, there are 3 caching options available out of the box. Used them when needed, and tweak them according to your needs. I hope I gave you some information about caching in a dynamic (DD4T driven) website on top of SDL Tridion to get you started. 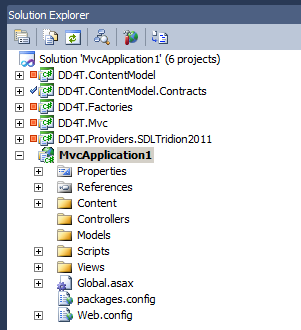 In my previous post I discussed how to get started with ASP.NET MVC3 and Tridion using the opensource DD4T framework. In this post I want to show you how DD4T handles the rendering of ComponentPresentations on a page. In my previous example, the whole HTML of the (Tridion)page was rendered by only 1 (razor)view. This is not a desired scenario, because it leads to big views and re-use is almost impossible. Tridion handles this quite nicely by using Component Templates. These templates are responsible for rendering their own little piece of content. And this is exactly what you want in your webapplication. So, how to implement this using the DD4T framework? Lets find out by creating a simple page. Next, we have to write some code to handle the rendering of the ComponentPresentations. 1. Create a new controller and name it ‘TridionComponentController’. This controller is used to render each ComponentPresentation on a page. The TridionControllerBase class reads the metadata from each ComponentPresentation to find out which razorview to use. The result of the Action-method is a rendered componentpresentation. Now, create a folder ‘TridionComponent’ in the ‘Views’ folder, and create a new razoriew. Give this view the same name as you defined in the metadata of your ComponentTemplate. So, in my case that is ‘Article’. Now we have to adjust our main view to NOT render the ComponentPresentations inline, but to use our new controller and the DD4T ‘ComponentPresentation’ Action method. Notice the @Html.RenderComponentPresentations()? This is a HTML helper from the DD4T framework that renders all the componentpresentations on the page, using our newly created ‘TridionComponentController’. This ‘RenderComponentPresentation’ HTML helper renders ALL the ComponentPresentations, but often you only want to render certain ComponentPresentations. 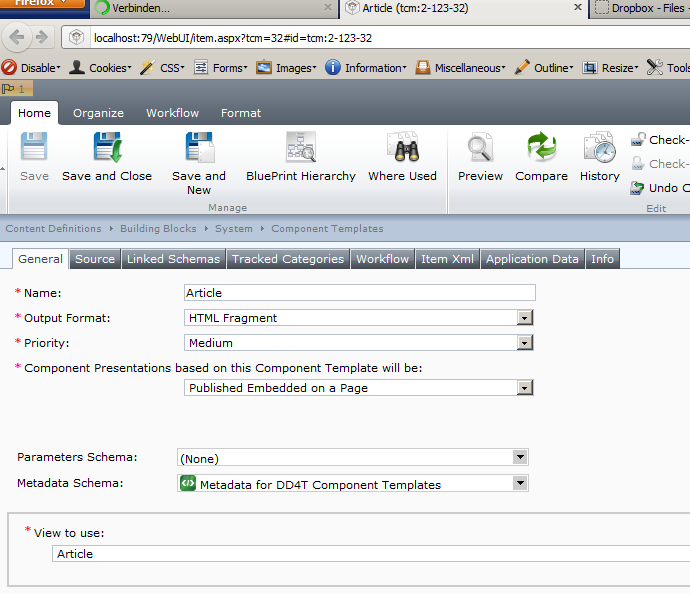 For instance, you want to render ‘Banner’ components in another section on your page then your ‘Article’ elements. This can be achieved by using one of the overloads from the ‘RenderComponentPresentations’ HTML helper. I hope this helped you to understand how ComponentPresentations are handled by the DD4T .NET framework. Let me know if you have more questions or problems using the above code. In short: Dynamic Delivery For Tridion (DD4T) is an ASP.NET MVC3 framework specifically designed to build a web(site) application using SDL Tridion. The sources contain the Java version and the .NET MVC3 version of the project. We are only interested in the .NET MVC3 version of the framework. 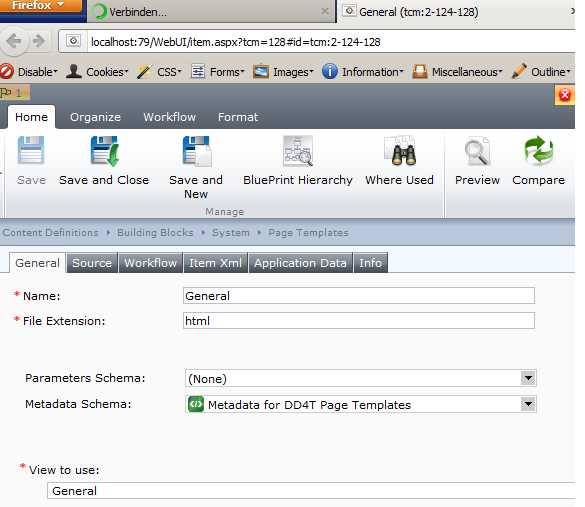 First, we have to upload the Template Building Blocks to the Tridion Content Management Server. Next, create a simple meta-data schema with one single line text (Preferably it’s a selectlist with values from a category) for usage on the newly created Component- and Page Template. This schema allows you to tell the DD4T framework which View (visual representation, ASP.NET MVC3 Razor template) to use when this Page/Component is rendered in the browser. Xml name of the field should be ‘view’. Next, we have to copy some Tridion dll’s into the following folder: %DD4T Install Path%\dependencies\Tridion 2011 DLLs. In here you find a file called ‘Missing files’. Read it, and copy-paste all the Tridion Dll’s into this folder. Now, add all the DD4T projects as a reference to your MvcApplication. Your solution should build fine now. Now we have added all the necessary framework parts, it’s time to wire up our first controller so we can view our page in the browser. Luckily for us, the DD4T framework has already done a lot for us. Al we have to do is to use the right methods and classes! 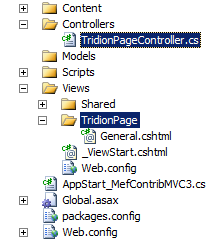 This makes sure that every request is passed on to the TridionPageController. Time to make the TridionPageController! Go to your MvcApplication and create a new controller. Right click on the ‘Controller’ folder in the solution explorer and choose ‘Add’-> ‘Controller’. By default all controllers from ASP.NET MVC inherit from the Microsoft Controller class. We don’t want this. We want to inherit from the TridionControllerBase class from the DD4T.Mvc project. Remark about the above code: The factories and providers are created here for simplicity. In a real world scenario you don’t want to do this, but you want to load the Factories and Providers by means of Dependency Injection (Unity, MEF, etc). But for now it’s ok. The TridionControllerBase defines a set of useful methods. We want our controller to look up the page (url) we requested in the browser from the Tridion Broker Database. Normally you would write code, using the Tridion dll’s to retrieve the Pagecontent from the Tridion Broker Database yourself, but the DD4T framework has already done this for us. This method retrieves the PageContent from the Tridion Broker Database by finding the Page by it’s Url (pageId = Url). So, make sure you published a page to the Tridion Broker Database using the DD4T Templates! The ‘Page’ method returns *something*, but we have to define of course how that ‘something’ needs to be visualed. In other words: we need to create a (razor) view. Views contain the HTML. Here we define how our page looks like. One of the advantages of the DD4T Framwork is, that you can have strongly typed views. This means that you tell your View that he (she) needs to render HTML for object of type IPage or IComponent or String (not very usefull) or MyArticleObject, etc. This gives you full intellisense when writing your View. Your view needs to render the HTML for an IPage object. (IPage object comes from the DD4T Framework). ASP.NET automatically wires up the properties from the IPage to the ‘Model’ keyword because we told this View that he (she) is destined to render HTML for an IPage object. (The ‘@model IPage’ directive). I hope this gives you enough information to get started with the DD4T Framework. The framework is actively developed and it is already running live in at least one big financial organisation. Disclaimer:This example is provided as is and is simplified for the obvious reasons. You are currently browsing the archives for the Content Delivery category.